If you’ve been injured at work it can not only be physically painful, but it also requires extra time and energy involved to help you return to work and get the compensation you are entitled to. There are a lot of details, appointments, and documentation that need to be dealt with as you journey toward getting back to work and recovery from your injury at the same time. There are Workers’ Compensation Insurance (workers’ comp) laws available to you if you have been injured at work. These laws offer you services ranging from medical benefits to rehabilitation support and supplemental income. While these laws and services are of great benefit to you, they also need to be documented and implemented appropriately in order to receive the full extent of the benefits that you are entitled to. The type and range of support that you will receive from your Workers’ Compensation are dependent upon the circumstances of your individual case and the state in which you reside. Workers’ comp is statutory insurance protection because the benefits you receive are established by each states’ statues (statutory law). While the coverage and benefits vary from state to state, they all provide you with coverage for medical bills and lost wages for workers who are injured while on the job regardless of fault. Each state has its own departments or divisions that handle the administration of your worker’s comp. Dwayne L. Brown has law offices in Georgia and Alabama. In Georgia, the State Board of Workers’ Compensation handles claims matter. In the state of Alabama, claims matters are overseen by the Department of Industrial Relations. To understand why Workers’ Compensation is so important, it’s helpful to reach back into history to see the issues that Americans had prior to it. During the Industrial Revolution people were working in extreme working conditions in factories. There were many hazards and it’s no surprise that the injury rates were in staggeringly high numbers. 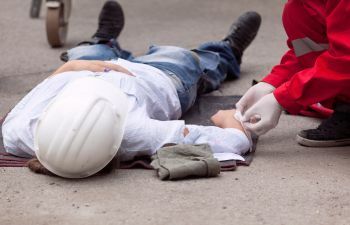 If a worker was injured during this time he rarely received compensation because the legal framework for injuries to be compensated were highly restrictive. These restrictions became known as the “unholy trinity of defenses.” The employer had to prove items such as contributory negligence, the “fellow servant” rule, and assumption of risk in order to avoid giving their workers any type of compensation. In 1906, Upton Sinclair published a novel, THE JUNGLE, which chronicles the dangerous and horrific conditions of Chicago slaughterhouse worker. The public was outraged and finally, Congress passed the Employers’ Liability Acts of 1906 and 1908. Wisconsin is the first state to pass comprehensive workers’ compensation law in 1911 and today’s basic structure for Workers’ Comp is essentially the same. While the government’s laws keep in mind your rights as an employee, it’s important for you to be very mindful of what those laws require and entail. It’s important that you develop your understanding of Workers’ Compensation Insurance so you can reap the optimal benefit from the law. If you are injured at work, report your injury to your supervisor immediately. If you wait to do so you may disqualify yourself from receiving any benefits. Be sure to see an authorized physician that your employer tells you to go to. After your injury, be mindful of whom you speak to regarding your accident and injury. And, when you do see a physician, be mindful to obtain a written work status option at every visit. Call Dwayne L. Brown if you’ve been injured at work. He can help you navigate the complexities of the Workers’ Compensation Insurance system for you to obtain the optimal benefits that you are entitled to. He offers a free consultation to discuss your situation and advise you of your options.